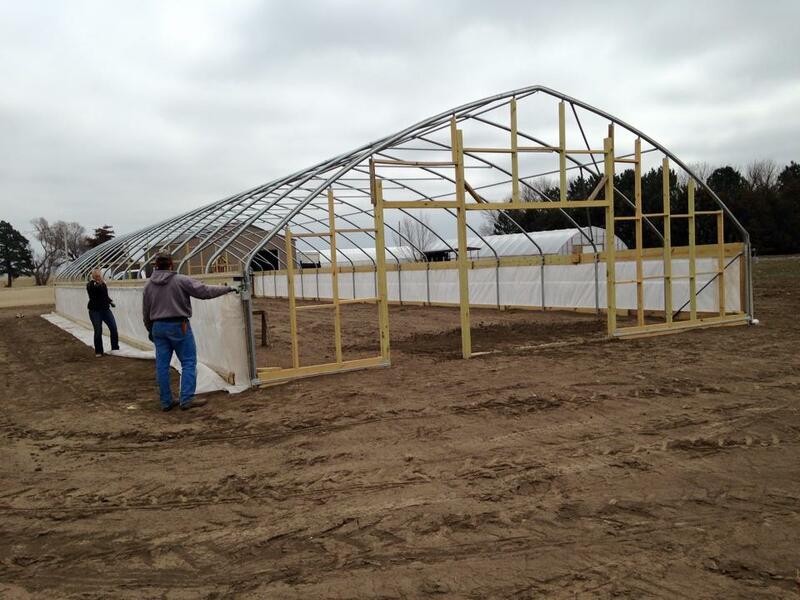 The High Tunnel is Up!!! Remember these pretty frames from over by Omaha? Well we’ve made something of one of them. 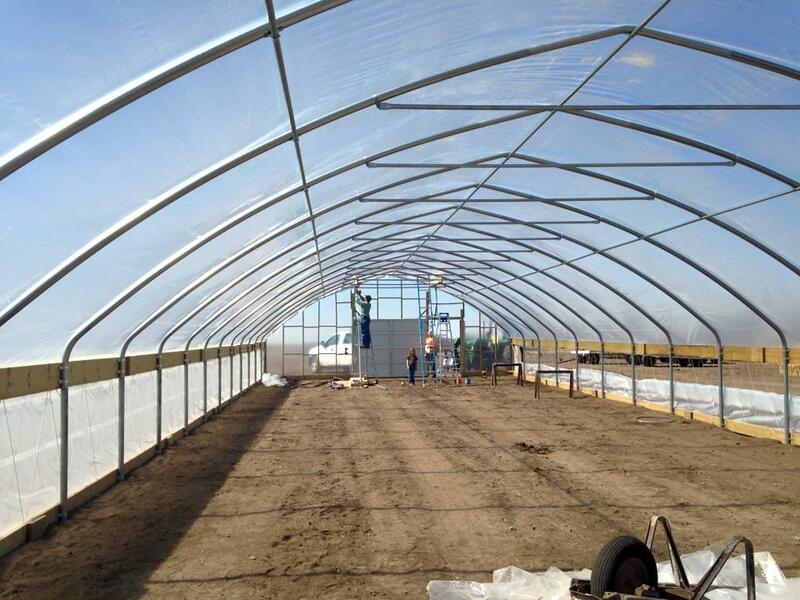 During our set of nice days, before the rain and snow, we got this tunnel completed! 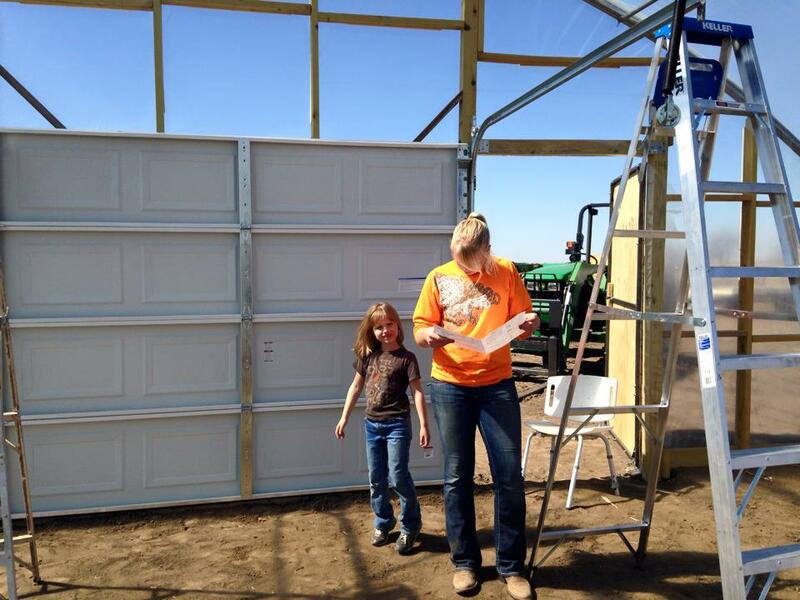 We had some great help putting up garage doors and walk in doors. Here we are putting on the roll down sides. They work like a charm and can passively regulate temperature in the building. Some tips and tricks of the trade we like to make you try to figure out yourselves. So I’ll let you just guess what Ryan is working on here. Putting up the endwall plastic and covering the building with plastic requires the most bodies on site. There was about a 2-5 mph wind the day we pulled plastic over the tunnel and the picture shows how Laura and I are flying a giant plastic kite! Thanks to Miss Margret for taking this pic. So wouldn’t you know it, the weather was nice a sunny… We had 60s. We had 70s. We even had some 80s. So we got excited on the farm. 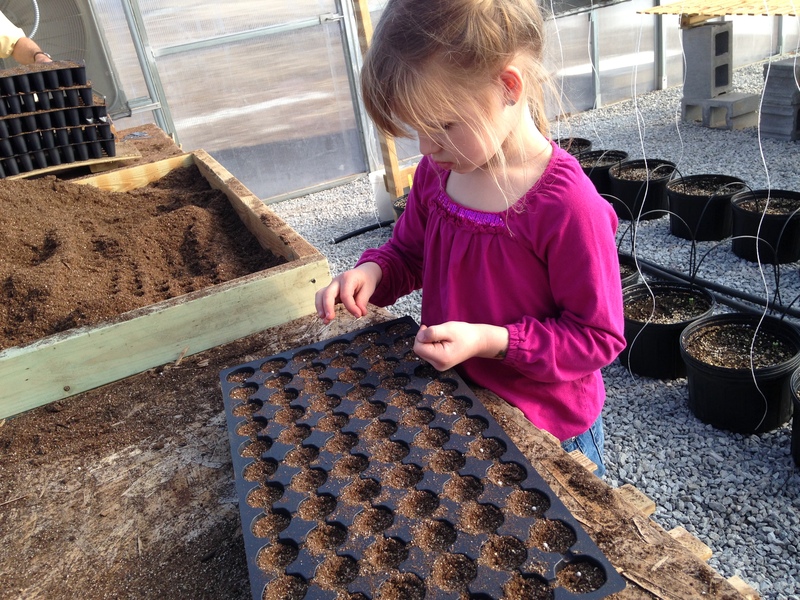 We started planting in the greenhouse. 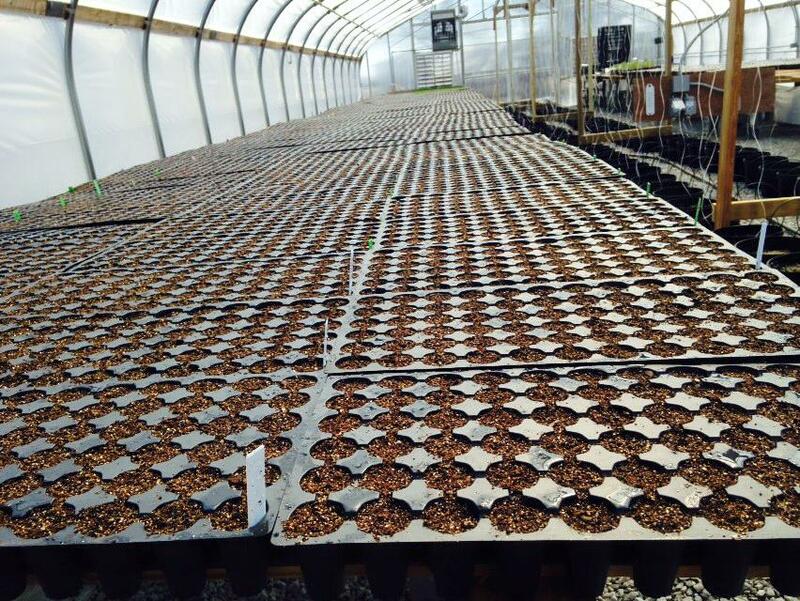 We’ve got the benches full of transplants. 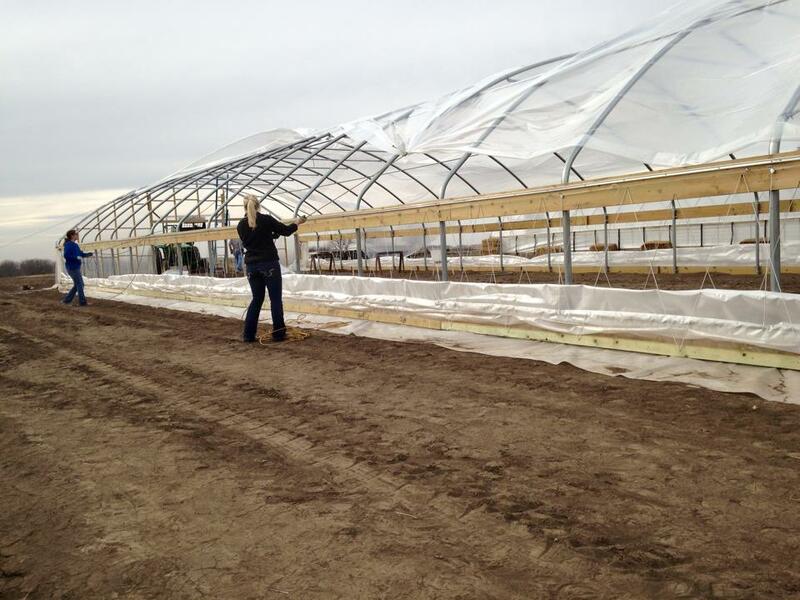 We finished putting up a high tunnel. 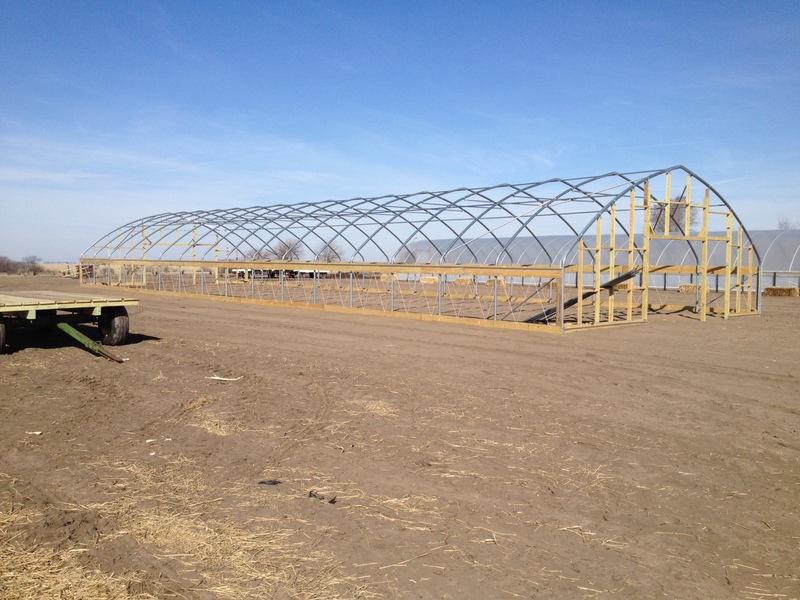 We got started on two more tunnels. 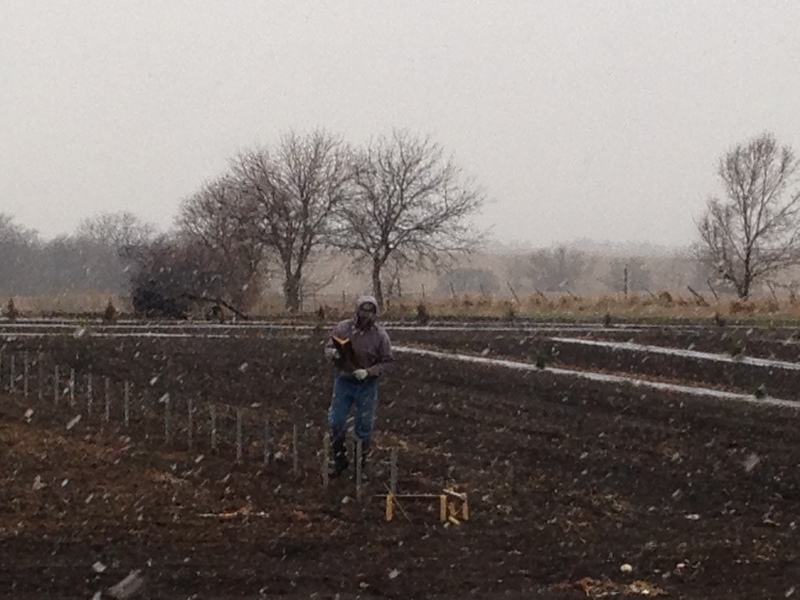 Ryan even planted radishes – and now: SNOW! Hopefully we’ll catch you all on the sunny side soon! 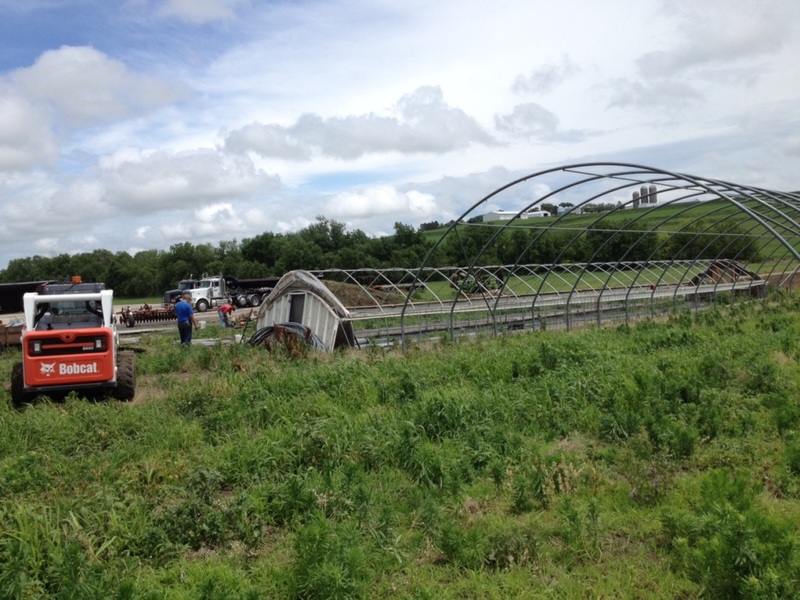 Some of you will recall from last year, that one of our late fall activities included tearing down a couple of greenhouses near Bennington. This was some sort of crazy adventure where we thought, “Yes. 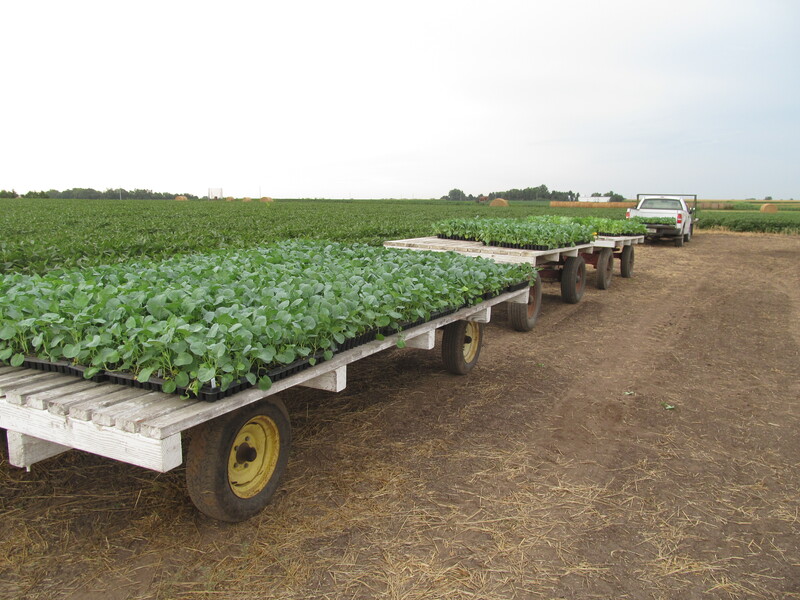 I do believe I would like to go into a weedy field, traipse around in the mud, crawl on loaders and use bobcats to ‘gently’ tear down some greenhouse frames.” This was a labor of love. 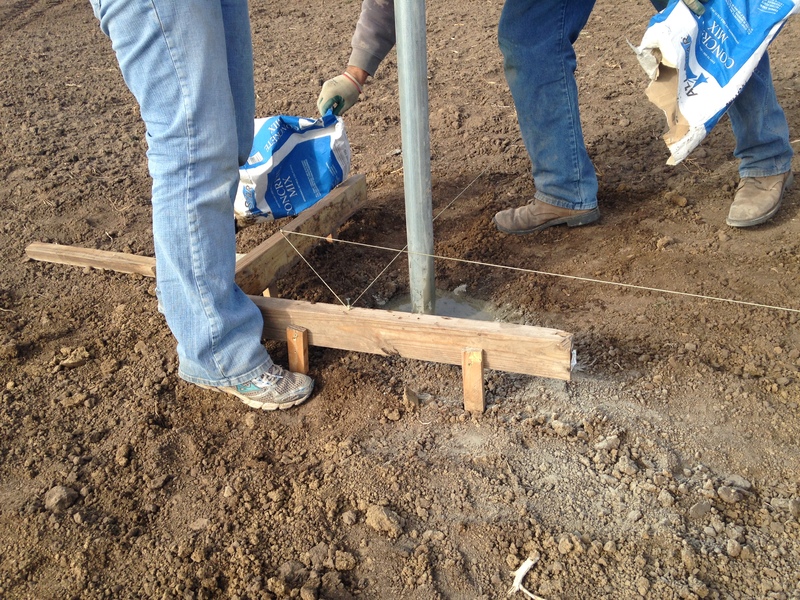 Concrete poured on high tunnel posts. We did get all of the frames taken down and brought home. We currently have the large frame up and have been waiting to get it skinned. The weather has to be right when you put plastic on. 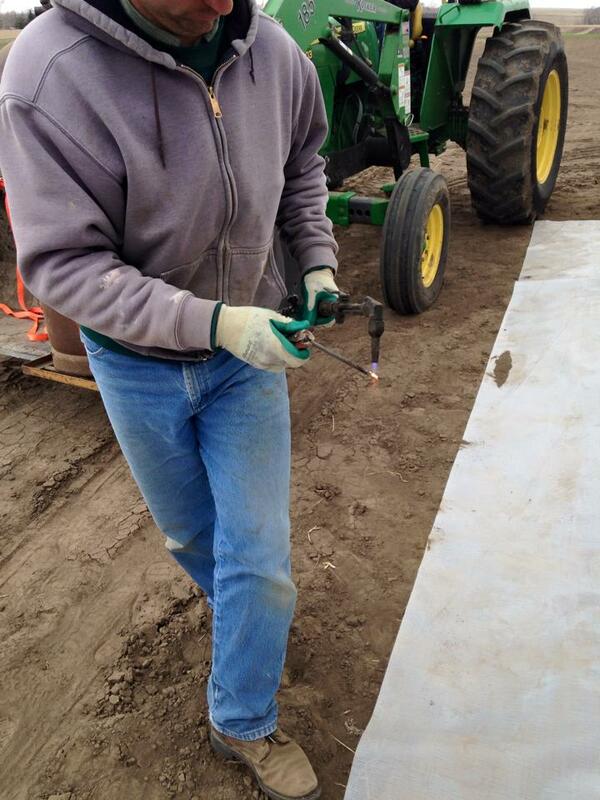 If it is too windy, you will never get it to lay down right. If it is to cold, the plastic will be shrunk. 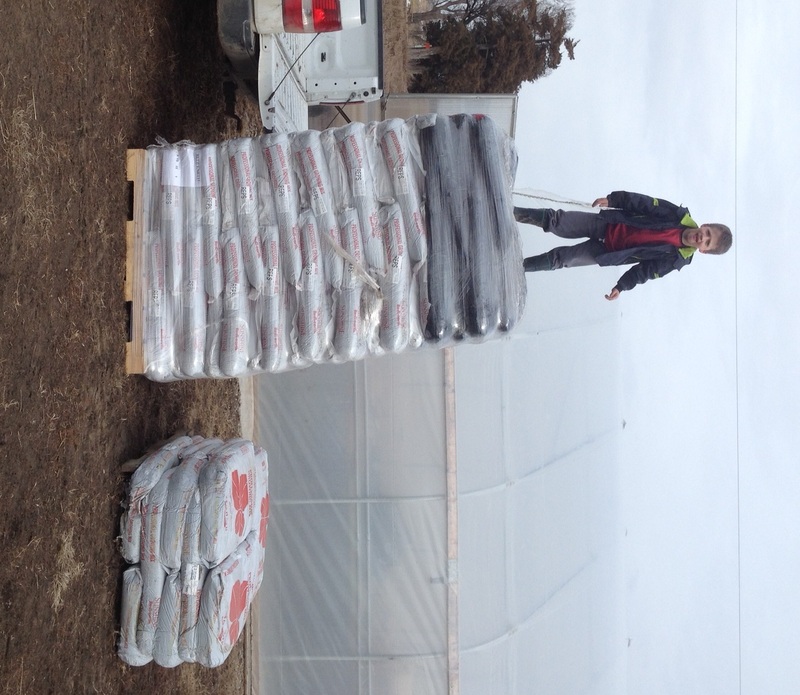 This means that on the first warm day, the plastic will loosen and we would have a floppy greenhouse. We can’t have that! Hopefully, we will put up the two smaller tunnels soon too! It is a wonderful reprieve to have such wonderful weather in March. I think we’ve all been waiting to break out of the cold snap and it’s really made us productive during the last week. 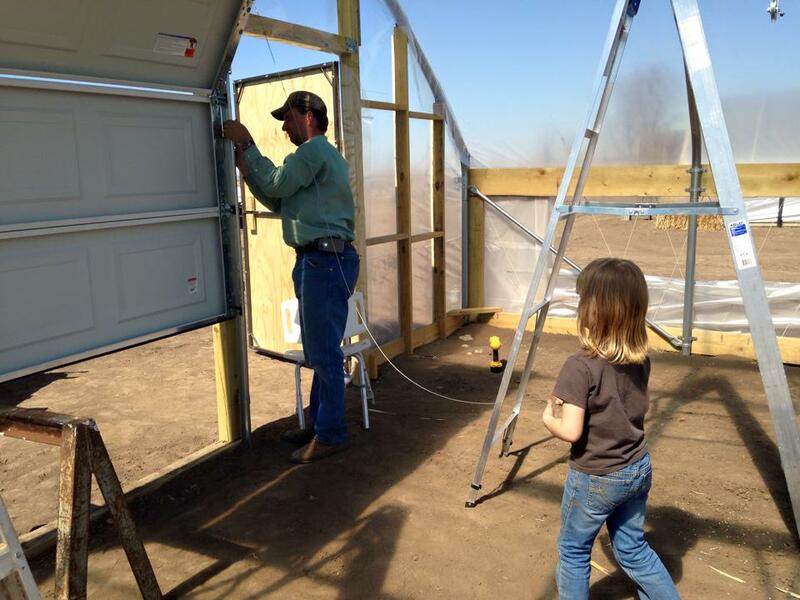 The entire family participated in filling up much of the greenhouse. 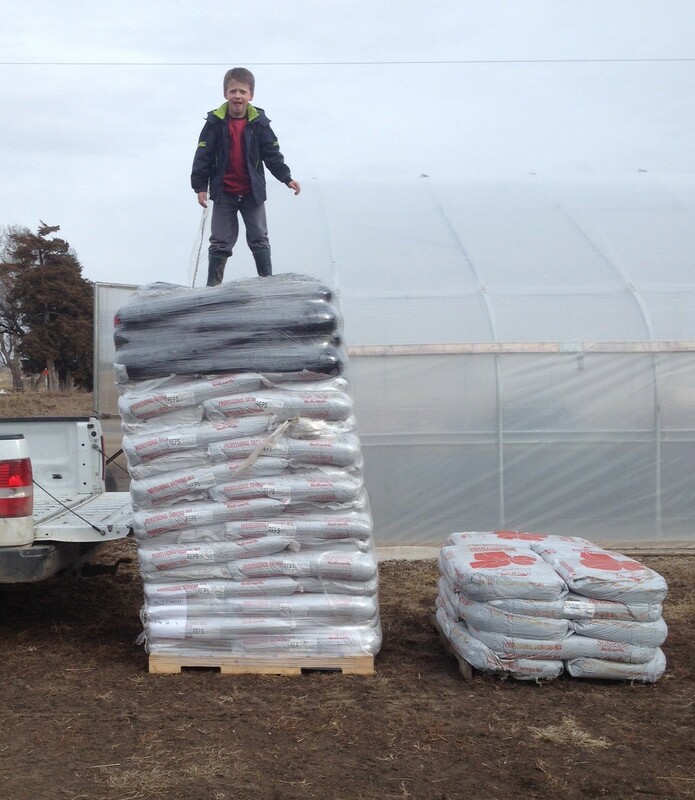 It all started with a soil delivery that came in February. 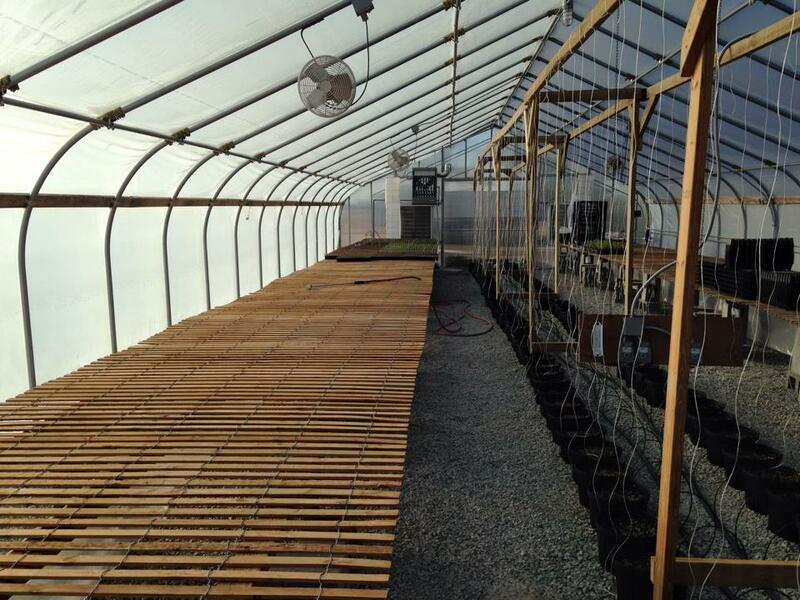 We had a few things planted before this week, so the greenhouse looked like this. The pots in the middle are not planted yet, but are scheduled to have tomatoes and cucumbers in them shortly. 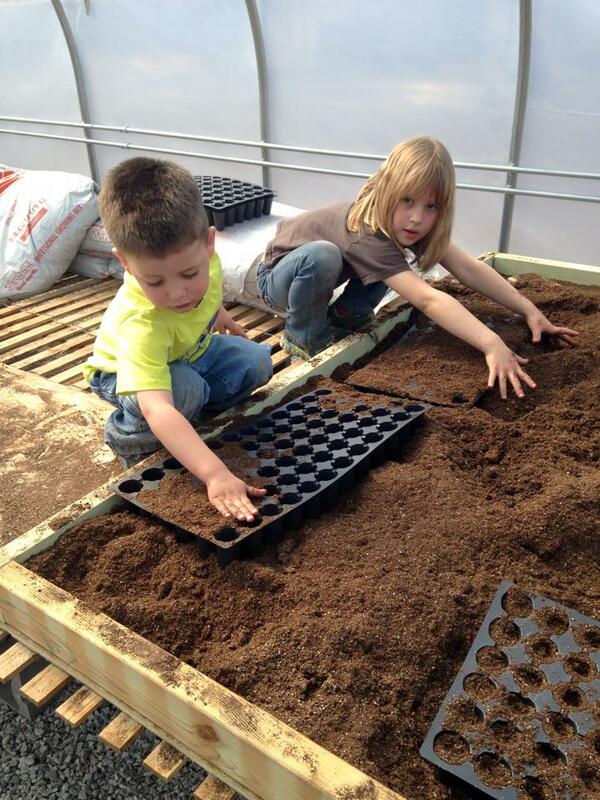 The entire family worked to fill trays with soil. 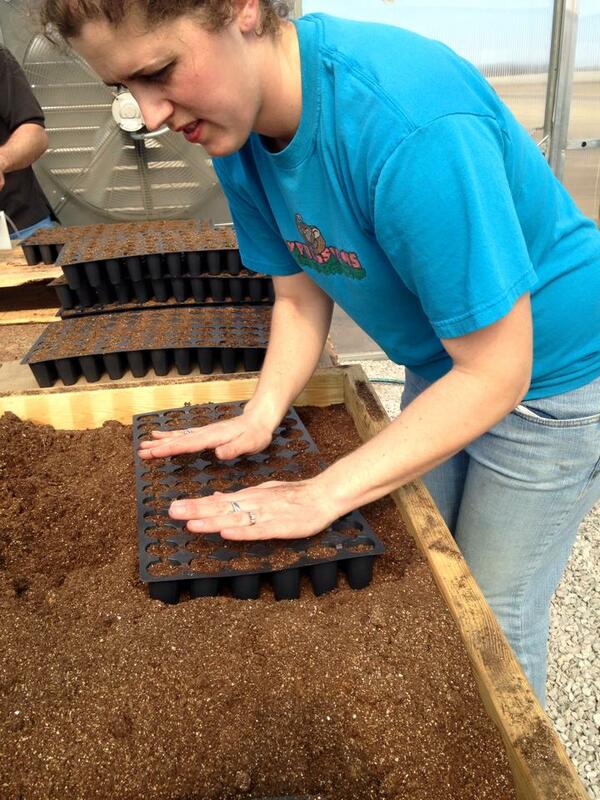 Then we covered them with soil before watering. At the end of it all, the greenhouse was starting to get full. 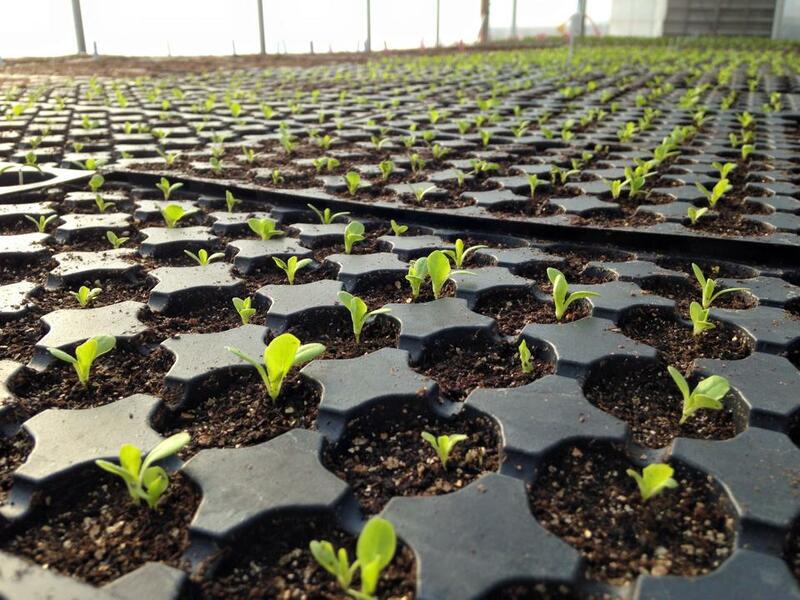 These little seedlings will grow in the greenhouse until we are ready to plant them in the field. By the time they are ready, they should look more like this. 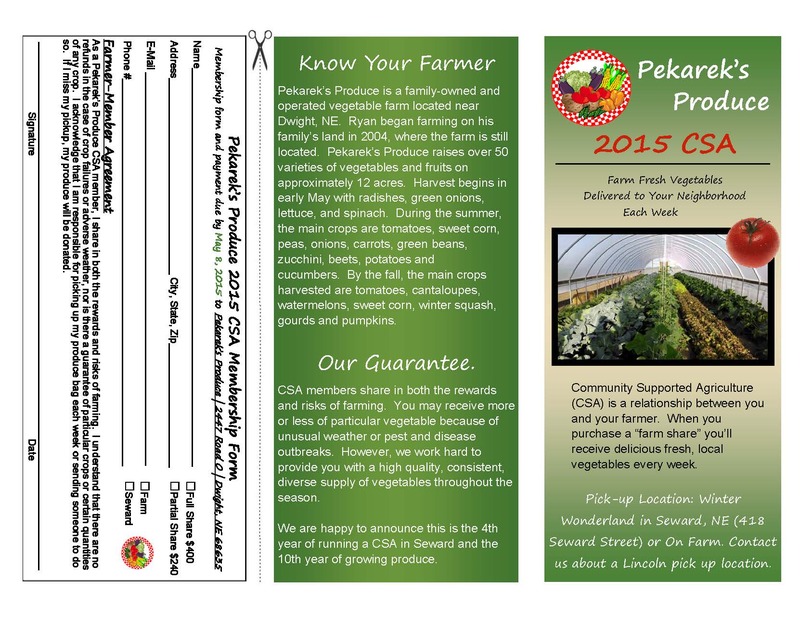 It is once again growing season at Pekarek’s Produce. 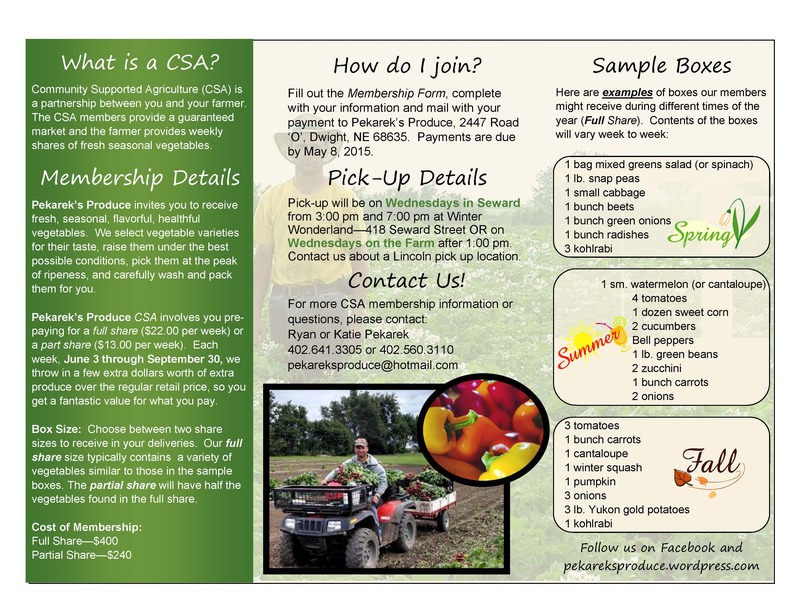 I always laugh when people ask what we do in the winter. The first thing we do is take a big deep breath! Then we start getting ready for the next year. 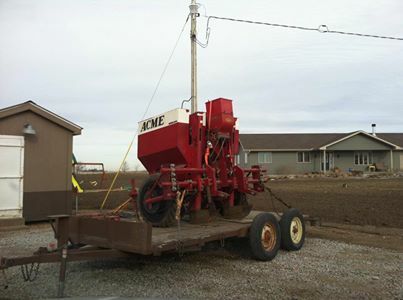 We order seed, which is a process that takes a few weeks. Ryan gets 10-15 catalogs in the mail, but really only orders from 3 or 4 different places. 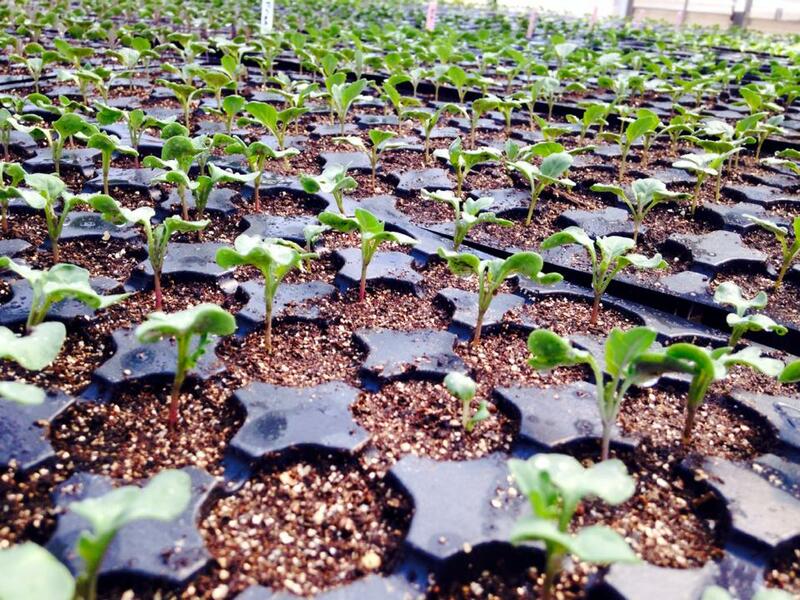 We order our sweet potato slips from down south because you know they know how to grow sweet potatoes in the south! 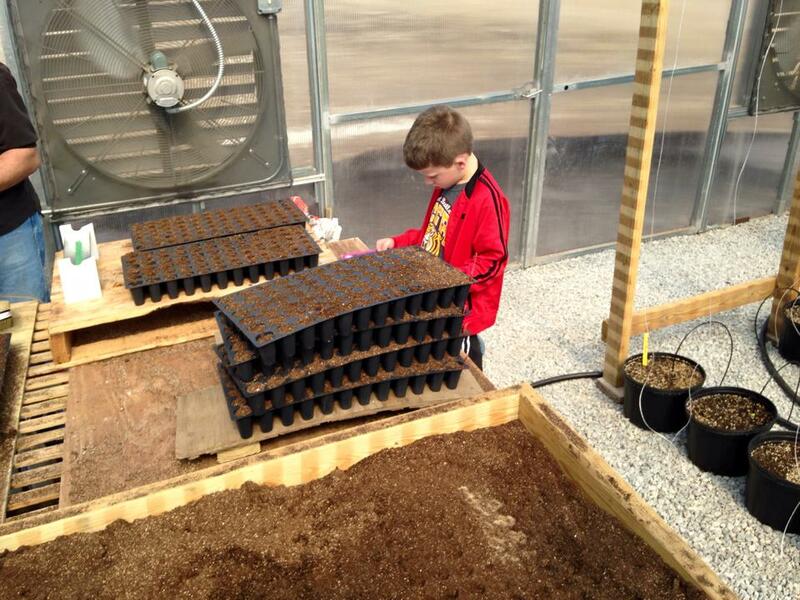 We order onions and potatoes, we order trays to plant seeds in for the greenhouse, we order soil to put in the trays. And while all this is necessary and helpful, it’s time to be outside again! 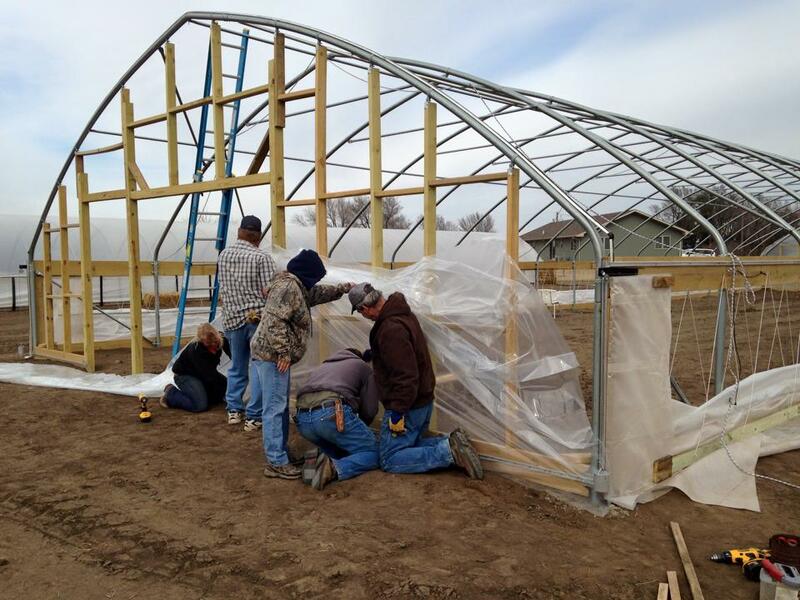 We have a high tunnel frame that needs to get “skinned” – meaning it needs some plastic. 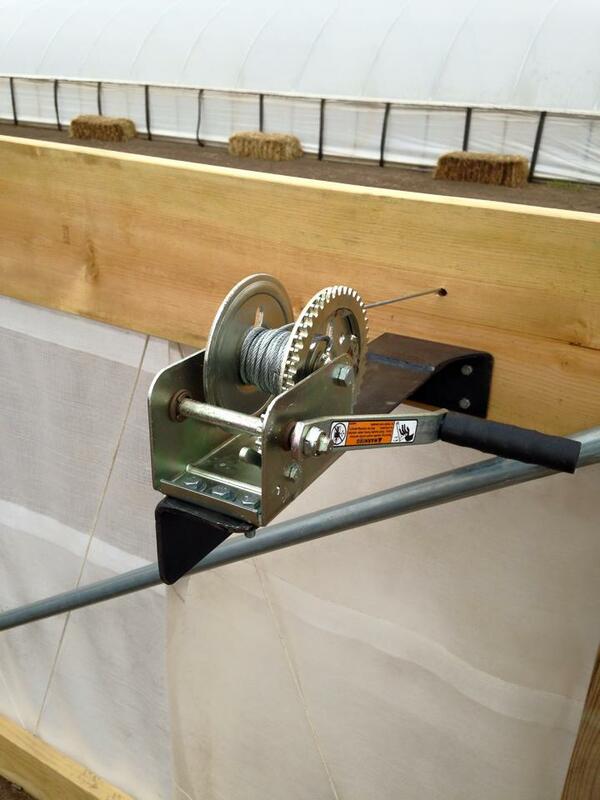 Ryan is working on fixing the roll up sides on a high tunnel. But most of all, it’s time to get GROWING.